St. Paul's riverfront is ready again for a rebirth, a developer told Ramsey County today, unveiling plans for the five-acre vacant site on the downtown riverbank between the Science Museum of Minnesota and the Intercontinental Hotel. It's at least the fourth attempt to remake the riverfront, left uncertain after West Publishing abandoned the site and moved to Eagan in 1992. The last effort, by a Phoenix-based developer, collapsed last fall. 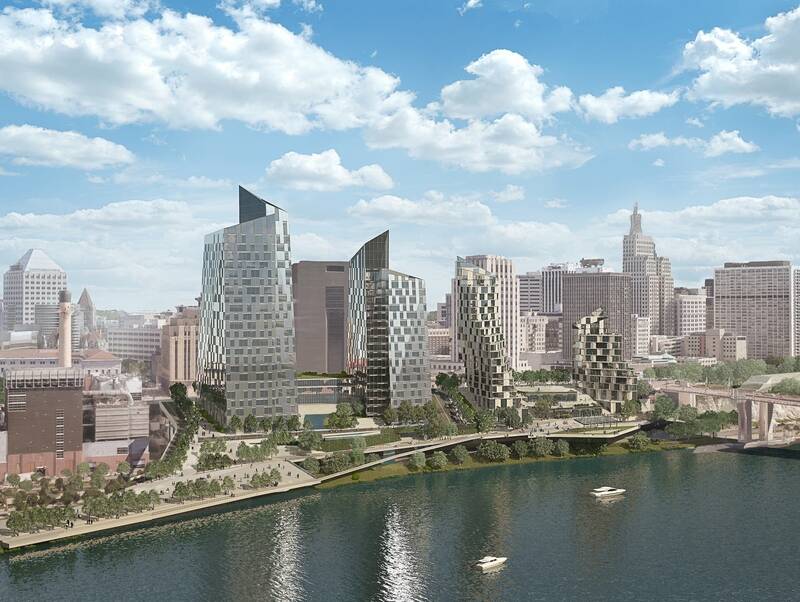 The new plans from developer AECOM include four proposed buildings, as well as a cover over Shepard Road and the railroad line along the river, to directly connect downtown to the river upstream from the Wabasha Street bridge. "We wanted to be very cognizant about how we connect this site to the downtown street grid and then to the riverfront. Instead of a wall, like the old West Publishing site, we actually open up the buildings," said Brian Dusek, AECOM's managing principal for real estate development. AECOM acquired longtime Minneapolis architectural firm Ellerbe Becket in 2009. It is also working on a building near the Guthrie Theater in Minneapolis. The firm told county commissioners at a special meeting Tuesday that the plans include connecting Market Street to Shepard Road, a massive parking ramp and wide open green spaces overlooking the river in a three-step redevelopment. The first construction phase includes two residential towers, including a class A apartment tower with 250 to 250 apartments, a 150- to 250-room boutique hotel and condominium tower with 80 to 150 units to be finished in 2021. A handout put the possible cost between $200 and $280 million. The second and third phases call for two office and commercial towers, the first about 250,000 to 400,000 square feet to be completed about 2023. That would have a potential value between $150 and $220 million. The other would be 600,000- to 1-million-square-foot tower, to be determined as the project develops and worth between $270 and $400 million. That has a projected completion in 2026. "This really is out of the box in terms of what we've seen before," said county commissioner Victoria Reinhardt said at the unveiling. Jim Thomson, a vice president at AECOM, said previous failed redevelopment efforts stopped short of the train tracks and Shepard Road along the river. He said a "lid" over the existing infrastructure was key to the success of his company's plans. "Our intention is to go over that and stretch all the way out. And that's why we feel that this is something that's extremely doable." The county took years to prepare the site, including getting its own operations out of the buildings that formerly housed West Publishing. The county then demolished the hodgepodge of 19th-century commercial space and the county's former jail, built in 1979 and replaced in 2003. The county spent $17 million to clear and prepare the site. 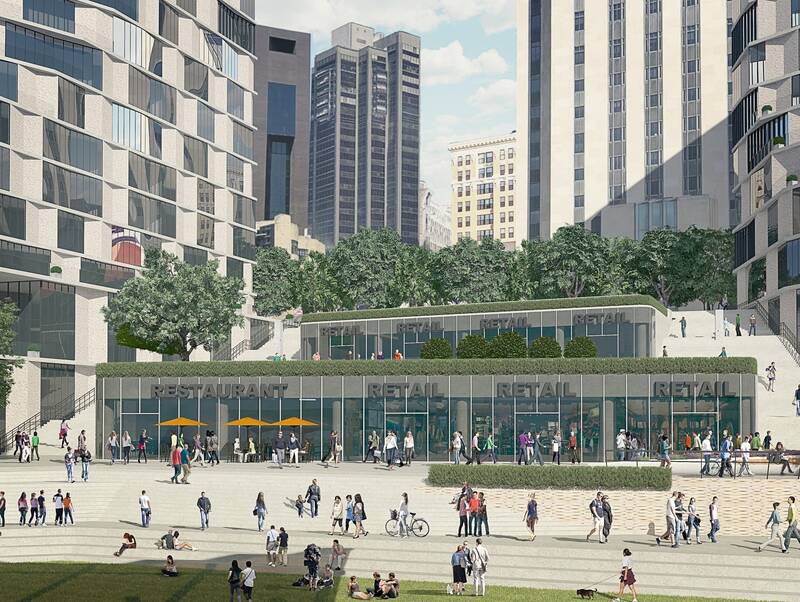 AECOM told county commissioners the plans include ground-level retail and restaurant offerings, seasonal pedestrian-only spaces, similar to the Wharf in Washington D.C. The plan would try to accommodate both parking structures, transit and, in the future, autonomous vehicles. The plans include enough parking to "serve" the site, with 1,200 to 1,800 stalls. One proposal would have the project initially built with extra parking, to replace stalls lost to a planned demolition and a rebuild of the city's own RiverCenter parking ramp. County officials hailed the project's public access and views of the Mississippi River. "I have never seen a proposal that drives the public connections like this," said Jim McDonough, the county board chair. "We're ready to move forward on this." The county opened the site for bids last winter. It received four bids. The county board voted to enter into a preliminary development agreement by the end of the year, and a six-month "due diligence" process to work out details of the redevelopment.